Last night I was honored to be one of the Guests of Honor at the 2012 LEAP Year Event. Every year, LEAP hosts an evening of food, conversations, and culture to raise money to support its nationally recognized after-school and summer mentoring programs for children and youth living in New Haven’s high poverty neighborhoods. This yearly event brings together corporate and community leaders for an evening of small dinner parties at prominent homes around the Greater New Haven area to benefit LEAP. My dinner was hosted by Elm City Market with Carol & Robert Orr at La Bourse, New Haven. 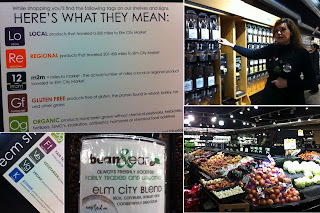 The evening started out with a tour of Elm City Market. The market, which is a co-op, has only been open since the late fall and already has over 1,300 members. I really love the mission of this market. It's all about connecting people to food and to community. 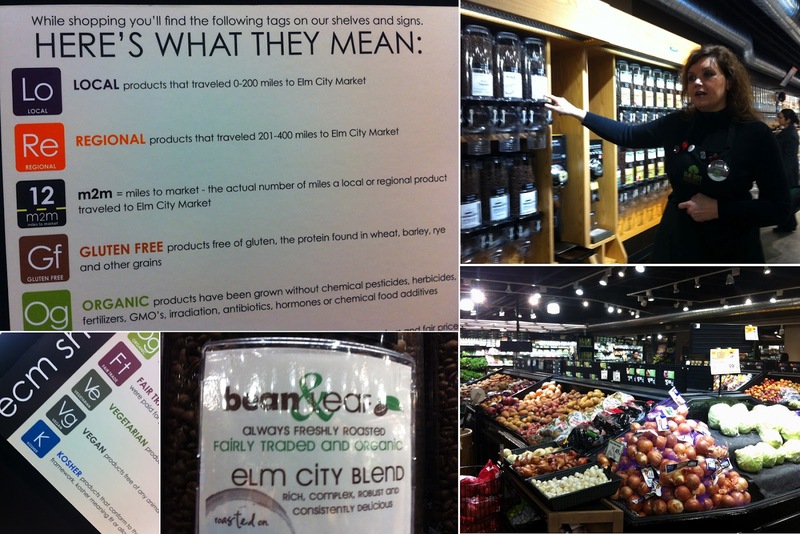 They call themselves a "hybrid" market - a combination of traditional grocery store and health food store. They carry a range of products from the things people are used to seeing, like Oreos and Cheese Nips, along with the things you'd be more likely to find a fancy-schmansy health food store. At the moment they carry 150 items from local vendors and have, what I think, is a really cool system to let customers can know about the products on the shelves. There are labels like Lo for local (items from 0 to 150 miles) or Re for Regional (up to 400 miles). With our tour completed, we headed to La Bourse for dinner. La Bourse is a co-working loft. A membership fee gets you access to this great space, free wifi and all the coffee and tea you can drink. I love the idea of having a space available for all types of professional people to use and collaborate in. You never know where the next great idea will be born. 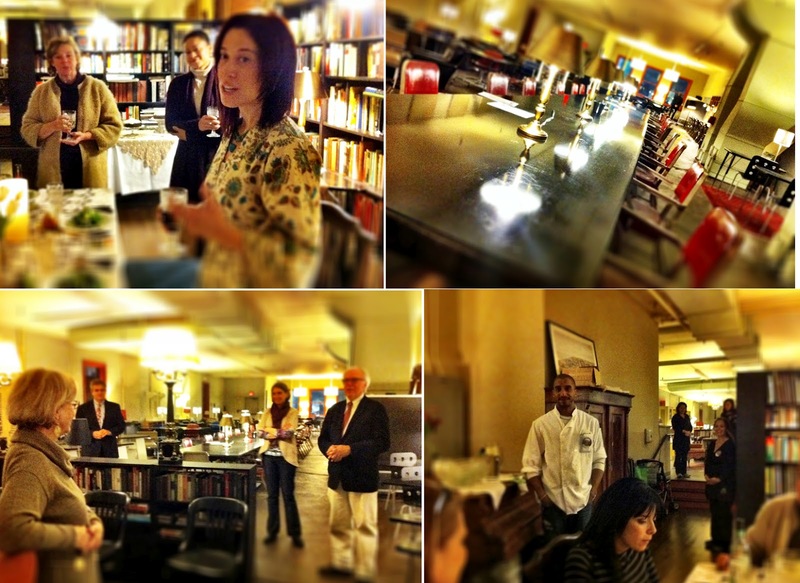 Not to mention that the space is perfect for a dinner party. So, on to the food! The dinner menu was created by Chef Angel of Elm City Market. First course: Arugula, Pear & Parmesan Salad - The crisp pear was a nice compliment to the salty Parmesan and spicy arugula. 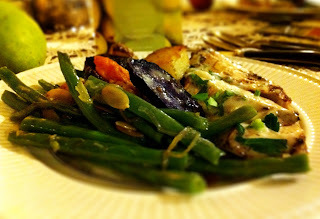 Second course: Chicken Breast with Buerre Blanc along with Roasted Potatoes and Green Bean Almondine - Classic flavors that seemed perfect for a chilly, wintry evening. Third Course: Flourless Chocolate Cake - decadent and amazing! With our dessert we enjoyed fair trade, organic coffee from local roasters Bean & Leaf. Let me just tell you, I never drink my coffee black, ever. Well, I drank this coffee black. It was flavorful, smooth and really just a great cup of coffee. 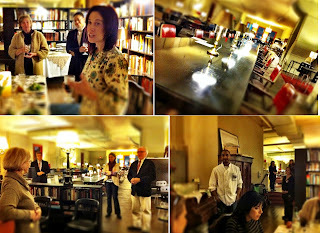 Thank you to all my dinner attendees and hosts. It was an all around wonderful evening. To learn more about LEAP and how you can help them be sure to visit their website.